The minute we stick a cartoon video in front of our 4 year old’s face, you can be sure we love your food. We love the ambience, service and the look and smell of the food SO MUCH that we want to give our COMPLETE attention to it and just pretend as if the brat at the table is not ours. So we dig up Peppa Pig or the like, distract the little one with it and sink back into the cushions smiling into a beautiful dinner ahead. That’s when you know we think mighty big of your restaurant. The dinner at Blue Grill Steakhouse in Yas Island Rotana evoked those feelings in us and thus, we hereby endorse the place for the fantastic food they serve to its unsuspecting diners. Why do we endorse it? Let me elaborate. From the server who poured our drinks, to the Executive Chef who came by to say hello, service was above average. Yes, it is unlikely for the Chef to visit a non-media table on an ordinary night. Having said that, if you are a regular diner wanting to have a word with the Exec Chef, he definitely seemed liked a man who will happily saunter over to chit-chat with you. It was one of those menus in which everything looked good to my eyes. From Angus beef tartar to Cumbreau oysters to Duck breast carpaccio, everything looked appealing to me. And therefore, I decided to willingly fall prey to my whims and fancies. Thus arrived on our table the Pan seared duck foie gras, the Seared king scallops, Charcoal king prawns and Cumbreau oysters. I agree, this was slightly too much for a table of 2, but my restraints were at an all time low and I was almost tearing up with hunger pangs. 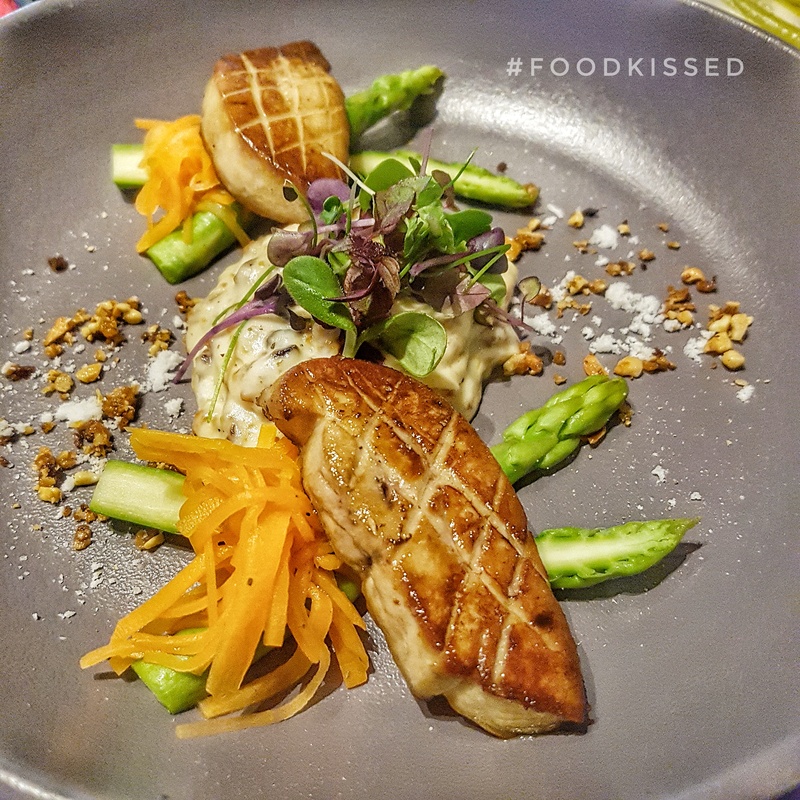 Pan seared duck foie gras (AED 68) came with asparagus, celeriac cream, vanilla oil & candied cashew granola. It was, in one single word, PERFECT. The foie gras was seared ever so slightly and it maintained that slightly wobbly texture as it rolled around my palette. Together with the cream and cashew granola, a delicious balance was reached and to be fair, this dish was good enough to guarantee another visit from me if I ever go moon walking in Yas Island. Seared king scallops (AED 70) had cauliflower, baby carrot and raisin jus with it and presented a feast to the eyes before carrying on the party to the palette. A sensational starter dish that the Chef can be proud of. The Charcoal king prawns (AED 72) came recommended by the Chef and for good reason. There was an avocado spread, cilantro cress and yuzu pearls which made for a smashing presentation. I didn’t catch the whole of the explanation, but the yuzu pearls contained tiny drops of lemon flavors in them which burst in your mouth enveloping the bites of king prawns. Yet another gorgeous creation. Crumbeau oysters (AED 80 for 6) were wonderfully fresh and tasted like the beautiful ocean in all its glory. Other than the fact that I’m nuts about oysters, and this tray of jewels were extremely well received from my end, I’m at a loss for further descriptive words. The mains were equally confusing to zero in on. After much analysis, the Short rib steak and the Prime T-bone Steak were finalized on. The T-Bone (AED 190) came under the restaurant’s signature cuts, weighed 500g and was pleasantly laced with meat fat (just what the doctor prescribed). The meat was medium well (as requested) and did complete justice to the entire reputation of Blue Grill Steakhouse. The Short rib steak (AED 155) was 72 hour sous vide with smoked mash, pumpkin butter and black trufle. It was a culmination of perfect elements, which can’t ever go wrong – and hence, created a detailed, delicious main course. As for the little brat engrossed in cartoon till now, the Chef made out a child’s portion of the Pumpkin gnocchi, with porcini mushrooms, sage butter and roquette leaves. Thanks to her notoriously small appetite, I called dibs on the assured takeaway of the gnocchi leftovers. There was a side of Sauteed forest mushrooms (AED 22) and a very tempting sauce of Foie gras cream (AED15) added to this, and needless to say, there was an inevitable case of over stuffed tummies. The foie gras cream needs to be tasted to be believed – it was rich, thick, aromatic and almost sinful. The perfect accompaniment to ANYTHING you might consider ordering if you are in for dinner at Blue Grill. It was only a matter of time before the grand decision on desserts were to be made. Trio Of Chocolate was a no-brainer. Choosing between the Lemon Cheese cake and the Blue Grill Banoffee was harder. In the end, the Banoffee won the battle. Chocolate trio (AED 35) consisted of Orange Jivara Cremeaux, Caramelia mousse and Ivory framboise ganache. As you might have guessed, I had no idea what these were – but evidently, it doesn’t matter. If you love your chocolate, the trio (regardless of the fancy names they carry) is sure to make you smile. The same applies to the Blue Grill Banoffee (AED 35) made of biscuit, rich butterscotch toffee, fresh bananas and Chantilly cream. A simple dessert, done perfectly and presented elegantly. Dinner at Blue Grill Steakhouse was an experience in itself. I’m completely enchanted by the starters menu – from the grand presentation to the detailed attention gone into each combining elements. I enjoyed every mouthful of everything I requested for onto my table, and if I had to pay for it all (as you would have to), I might only hesitate on the King Prawns (2 costing Aed 72), and gladly open my wallet for everything else, especially the Foie Gras. If you visit this place, I’d love to know what you thought of it. All the more so, if my words had any influence on your food order! Bon Appetit!